I grew hot peppers for the first time this year, even though I’m not a big fan of spicy food. I figured my nephew would find a use for them, as he enjoys spicy food. I planted a row of about 12 Cayenne and 12 Numex Sunrise peppers. The peppers far exceeded my expectations. 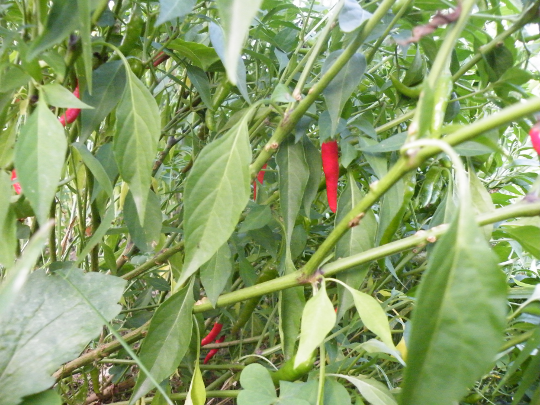 They set lots of little peppers, in colors that have rivaled some Christmas trees I’ve seen. 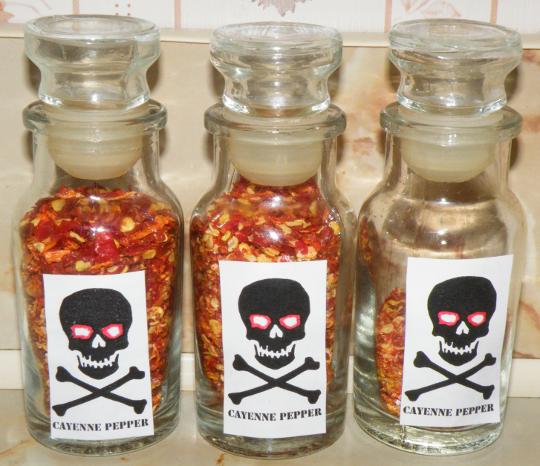 Even thought I won’t use them often, I couldn’t let all of these peppers go to waste, so I did some searching and experimenting, and found that you can dry them out, grind them up, and use them as seasoning. The peppers shown above have been sitting on my kitchen table for about two months. I shuffled them around a bit daily to keep the air circulating. The red peppers have retained their color, but the green, orange and purple peppers have changed. Now that the peppers are dry, it’s time to grind them up. I started by removing the peppers that shriveled up or looked unappealing. Next, I cut off the stem, including the very top of the pepper, and placed them in my retro mixer. 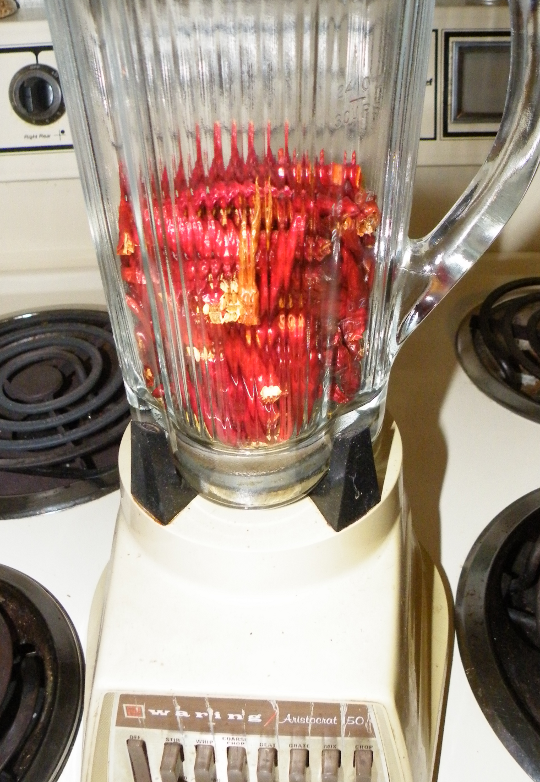 I set the the mode to “liquefy”, and held the top on snugly. 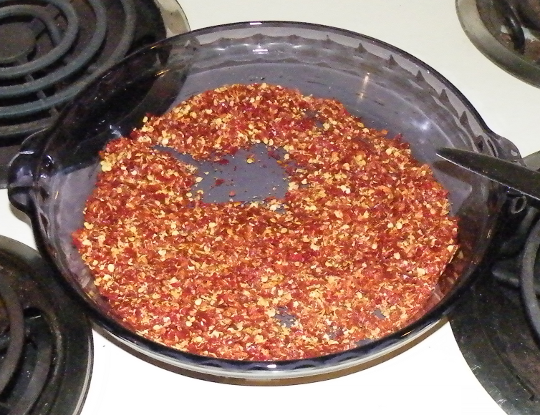 When the peppers were reduced to tiny chunks, I removed the glass portion, opened the lid and looked down in. I was careful not to breathe in….. but it didn’t matter. These peppers are so potent that the dust found it’s way into my throat, and left me wishing I hadn’t looked. Next time I’ll wear a mask, and rubber gloves ! I then poured the ground up peppers back into a glass bowl, and let them sit on the table for another week, stirring them daily. 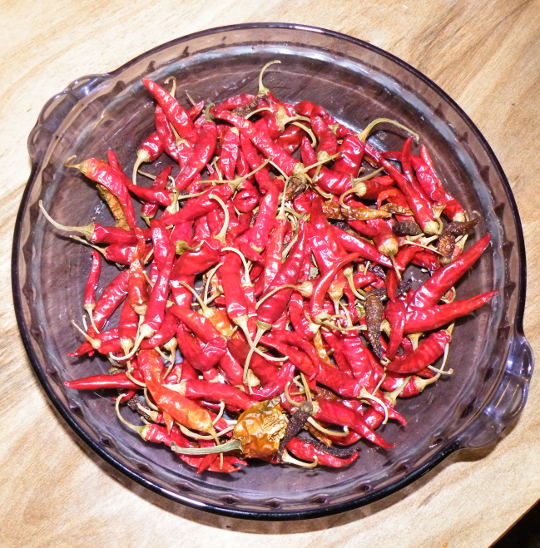 I imagine there is enough hot pepper in that photo to last me the rest of my life…. Hot Pepper Seasoning with Warning Label. When it was time to imagine a label for this seasoning, I couldn’t help but think safety first. This seasoning must clearly remind the user that it’s not garlic or cinnamon, but natures heat in a bottle. I settled on a skull and cross bone, with some red fiery eyes, which should get the point across to any one who dares open the top. Excellent. That brings back memories. I grew what were supposedly “jalapeno” peppers two or three years ago. To make a long story short, they were hotter by a factor of 50x, if not more. I still have the jar of ground dried pepper I made that year, as it only takes a tiny pinch to season an entire batch of chili. Mine is labeled “Oh Sh*t!”. I noticed the third bottle is only half full. you could not have used all that already. They are very very very hot!!!!!! you had a bumper crop for sure !!! !